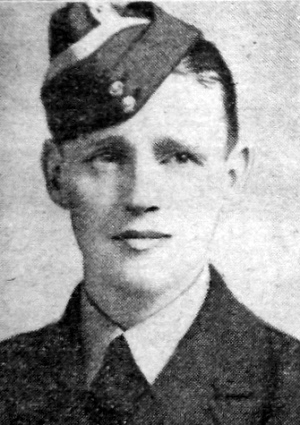 Sergeant Cyril Flint, 14661075, Royal Air Force Volunteer Reserve. Cyril Flint was born in Ossett on 22nd August 1913, the eldest child of Heckmondwike born coal miner James Frederick Flint and his wife, West Bretton born, Anne Watson (nee Hall), who had married in the Ossett area in the summer of 1912. Cyril had the following siblings: Doris, born 1915; Donald and Gilbert (twins), born 1917 and Bessie Flint, born 1923. James Frederick Flint had moved to live Spa Street, Ossett by 1901 where, aged 14 years, he was working underground as a pony driver. By 1911 he was boarding at Dodworth, Barnsley and working as a coal trammer. By 1939, James Frederick Flint, his wife, Ann Watson Flint and three of their children, including Cyril, were living at 8, Moorlands Avenue, Ossett. James Frederick was still working as a miner, but Cyril was by then a labourer for a coach painter. Cyril Flint married Ivy Wimpenny in Ossett in the Spring of 1940, but there don't appear to have been any children. Sergeant Cyril Flint was the navigator on a Lockheed Hudson I twin-engined bomber, N7343, and was completing his training at No.6 (Coastal) Operational Training Unit at RAF Thornaby, then in North Yorkshire. On the 18th May 1942, Sergeant Cyril Flint and the rest of the four man crew of the Hudson embarked on a meteorological flight out over the North sea to assess local flying conditions. This was because the steelworks at Redcar and Middlesborough, together with other associated heavy industry created a lot of smog, which filed the Tees Valley and restricted visibility through the barrage balloon field at the airfield. The met flight was used as a normal training flight by the OTU crews with the idea that if the smog was clearing, then all was well. However, if the smog persisted, the crews needed to learn how to fly in it before being given full operational status. For reasons unknown, the Hudson never returned and it is assumed it crashed into the North Sea somewhere off the mouth of the Tees Estuary with the loss of all four crew members. The Lockheed Hudson was an American-built light bomber and coastal reconnaissance aircraft built initially for the Royal Air Force shortly before the outbreak of the Second World War and primarily operated by the RAF thereafter. The Hudson was the first significant aircraft construction contract for the Lockheed Aircraft Corporation—the initial RAF order for 200 Hudsons far surpassed any previous order the company had received. The Hudson served throughout the war, mainly with Coastal Command but also in transport and training roles as well as delivering agents into occupied France. "An Ossett Airman Missing - Last Training Flight - A telegram was received by Mrs. C. Flint on May 19th that her husband, Sergeant Cyril Flint (28), was missing on a training flight. Sergeant Flint, who lived with his wife at Goring Park Avenue, Junction Lane, Ossett, was a native of the town, being educated at Southdale Council School, Batley Grammar School and St. Luke's College, Exeter, he was afterwards employed by Messrs. Charles Roberts and Company Ltd., Horbury in the painting department. He volunteered for service in February 1941, and, after training in Canada for eight months as an observer, returned to England to complete his course. In a letter to his wife, received a few hours before the telegram in question, he said he expected to pass out on that day (May 18th) and come home on seven days leave. The same day he went out on his last operational training flight, from which he is reported missing. A member of St. John's Methodist Church, South Parade, he had been secretary of Ossett Town Football Club and Ossett Common Carnival for a few years prior to the war." Above: Lockheed Hudson I twin-engined bomber and reconnaissance aeroplane. Sergeant Cyril Flint died on the 18th May 1942 aged 28 years and is remembered on Panel 83 of the Runnymede Memorial. This Memorial overlooks the River Thames on Cooper's Hill at Englefield Green between Windsor and Egham on the A308, 4 miles from Windsor. The Air Forces Memorial at Runnymede commemorates by name over 20,000 airmen who were lost in the Second World War during operations from bases in the United Kingdom and North and Western Europe, and who have no known graves. They served in Bomber, Fighter, Coastal, Transport, Flying Training and Maintenance Commands, and came from all parts of the Commonwealth. Some were from countries in continental Europe which had been overrun but whose airmen continued to fight in the ranks of the Royal Air Force. 1. "Ossett Observer", Saturday 6th June 1942.